Marco and CATEX - Marco Beverage Systems Ltd.
“CATEX has evolved as an event to showcase not just catering equipment but to showcase innovation within every sector of the Foodservice sector. In 2011 CATEX partnered with both the VFI and also the LVA to highlight how the on trade was starting to embrace food and the various options available to publicans from a very simple entry level right up to becoming a Gastro Pub. Good stuff. As usual we will be displaying our full range of Irish built water boilers and coffee making equipment focusing on their advantages from an economic and ecological standpoint. But this year we’ll also be launching the hotly anticipated Marco BRU. Lovely isn’t it? 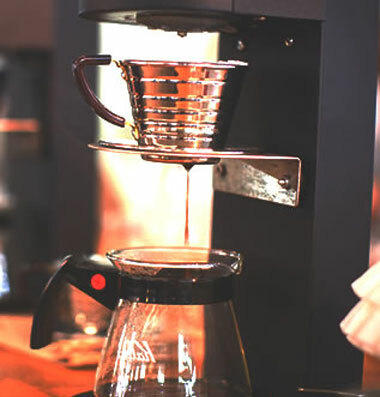 It will be operational and producing the highest standard of coffee during the event. Come along to stand F27 to to try the coffee, have a chat and learn more about it. Speaking of coffee, a huge thanks to Tim Wendelboe and Square Mile Coffee for providing some fantastic coffees for the event. Also a big thank you to Karl Purdy and Coffee Angel and Colin Harmon and 3fe for providing the brew making equipment. We think it’s going to be great coffee and a great event. We will be running one cup brewing masterclasses on the stand at 3pm every day but feel free to ask questions of our barista at any time and she’ll be more than happy to help. We’ll have a full compliment of staff on hand to deal with any equipment queries or just to have a chat over a tea or coffee. If there’s any questions you’d like to raise before the event just drop an e-mail to info@marco.ie or tweet us @MarcoBevSystems. We’ll have pictures and an update directly after the event but if you’re around please do swing by the stand.